Wondering exactly what are flower guides? Nearly everything you buy these days comes with a how-to guide for its use. Why not for flowers? Flower guides can be a huge help, whether you are trying to figure out how to arrange flowers, how to care for specific flowers, or how to choose flowers for a special event. The following article will give examples of some guides that you may find useful. If you are new to gardening or if you are experienced but looking for fresh ideas, planting guides can be a true inspiration. You can find plans for container gardens or for special gardens like butterfly gardens. Some seed catalogs also have planting schemes for your flowers. Here are two examples to get your creative juices flowing. American Meadows has a long list of garden ideas that are professionally designed. Each garden plan has all the flowers you will need and a planting layout to show you how to arrange them. This site has lots of great ideas! Simply Beautiful Gardens is a fantastic site that you will go back to again and again. They have several flower guides for container gardens so you can add a touch of color to any area of your landscape or create lovely garden gifts. Extension offices and universities offer many flower guides for free or for a nominal fee. Most counties have a local extension office that is partnered with a university. Pay yours a visit and ask what kind of flower information they have. Or you can check out these online guides. 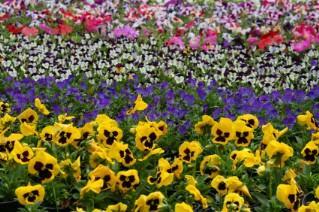 The Clemson extension office in Clemson, South Carolina offers a nice guide on spring flowering bulbs. You can read it online or go to the printer friendly version to take with you to your garden. The University of Illinois Extension Service has a very detailed guide on flower bulbs that you will find helpful. Cornell University has flower guides for 269 different flowers. You can search by the botanical name or the common name. If you love flowers, you can spend a lot of time on this site. The University of Arkansas Extension Service has a searchable database that contains many flower guides in PDF format for you to print and use. Search by category and type "flowers" in the search box. You can also browse all of the Agriculture publications for a wealth of gardening information. Kansas State University sponsors this guide of wildflowers and grasses. American Meadows has a garden bulbs guide that is divided by plating time--either spring or fall. Proflowers.com has several flower guides that will give you information on a variety of topics including flower meanings, birthday flowers, rose colors and meanings, and much more. If you like to be able to pull a book off the shelf to find the information that you need, here are some places to start. Amazon has literally thousands of flower guides. Here are a few to check out. 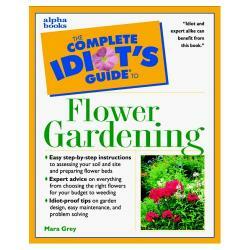 The Complete Idiots Guide to Flower Gardening is a fantastic guide for beginners and pros alike. Retail price starts at only $2.45! The Gardener's A to Z Guide has hundreds of flowers listed. This book lists every flower you can imagine and then some. If you like tropical flowers, you'll love the The Handy Pocket Guide to Tropical Flowers. Simon and Schuster's Guide to Garden Flowers is a great paperback guidebook to have on hand. With full color pictures and descriptions of 369 species of flowers, this book will quickly become a favorite.